It's warm, flowers are blooming, and nectar/pollen can be found in abundance which leads hives start their natural reproduction cycle called swarming. When things are this nice it is highly likely that strong hives will issue not only a primary swarm but also secondary swarms. The primary swarm is generally headed by the existing queen and any after-swarms will be headed by newly emerged virgin queens. I recently picked up a 6ish pound swarm (18K bees) that was half on the side of a raised bed and half on the ground inconveniently located under a bush. My guess is it started out on a branch that drooped down to the grass. When they are on the ground you mostly have to scoop up bees until you get enough of them in the box to attract the rest, or the queen goes into the box. So away I work and as I'm scooping I noticed several bees clustering around one spot in the grass. Thinking the queen might have been there or still be there I gently moved the bees around and my heart sank at what I saw. There in the middle was a dying queen. I carefully helped her into a queen cage and added a few attendants and put her in the hive box hoping the scent of her dying body would be enough to get the workers into the hive. Wondering what happened I kept scooping up bees and then again at that spot were I found the dying queen a new small cluster of bees was forming. I brushed the bees around once more and to my surprise found another weak queen but maybe not dying. Not having a second queen cage on me just put her in the box. Then shortly after that everyone else started going into the box and no new clusters formed. I didn't find a single dead bee on the ground besides that one dying queen so it wasn't an accident she was dying. I suspect what happened is a secondary swarm issued from a hive and in the departure the new virgin queens became confused who was actually leading the swarm and all left together as one group. 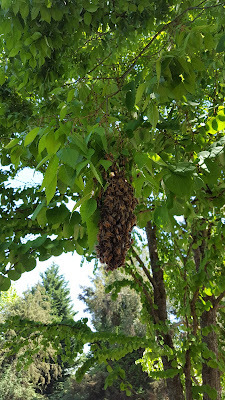 Typically I hear about several small swarms on nearby branches that each have a queen, and sometimes they all end up in one mass and eventually work it out. What surprises me is that the queens would fight inside the swarm like this. I suspect there were at least three queens in the cluster and hopefully the final victorious queen will be able to mate this week. It'll be another week or so before I can start looking for eggs. Sadly the photo's I would like to have posted aren't great since some rude bee was always flying in front of the lens, but not to leave you with nothing here's some related bee photos. This was left over from someone's swarm and didn't have a queen, but is what I would expect to see if there were multiple queens leaving in little swarms. Here's a photo of new comb that my overwintered hive is making. The swarm will be making several frames of new comb like this while we wait for the queen to mate.